Do you also have this? A thing is broken. It's completely useless. But still you don't throw it away. Do you have this same habit? I know it's silly. But it's probably based on some childish belief I cherish that one day I might need this broken article, or - in spite of all appearances - I might be able to repair it. A few years ago, there was a shop in Amsterdam named Radio Lenssen. It had three shop-windows. One was mainly devoted to broken goods. Yes, you're reading this correctly: broken goods. "Nobody buys broken goods," you'll probably retort. Well ... I must admit: I am among those fools who purchased broken goods from Radio Lenssen. One day I saw some big boxes in the shop filled with several kinds of chess computers, none of which were in my collection. Maybe you can imagine the greed that came over me. I asked mr Lenssen: "Are they in working order?" And probably quite truthfully, he answered: "I haven't tried." Well, I interpreted this as: "They might still be working." And since they were only 10 guilders (about £3.50), I bought one. Since then I have wasted several hours trying to get it to work - but to no avail. Still, I'm the sucker who believes one day someone will come along with the manual and show me that if I first press this key and then that, the machine will play a nice game of chess. The first time when I read about it in the magazine New Scientist , my greed was aroused immediately: a radio that got its electricity from a wound up spring. A radio that needed no wallsocket and no batteries - a portable radio as portable radios are meant to be - as some advertisements have it. Several years later, I visited the Belgian supermarket GB . Suddenly, there it was. 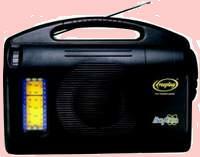 But it wasn't cheap - it cost about six times as much as a comparable battery-powered radio. I haven't used it very often. After all, I also don't want to hear other people's radios at the beach. And why use it at home when your regular radio gives a much better sound and doesn't have to be wound up every half hour? But one day when I did want to use it, the spring appeared to be broken. Although it can't be wound up any more, I still don't want to throw it away. And now its uselessness daily stares me in the face. So I'm wondering: have you got this as well? Or am I the only idiot around?